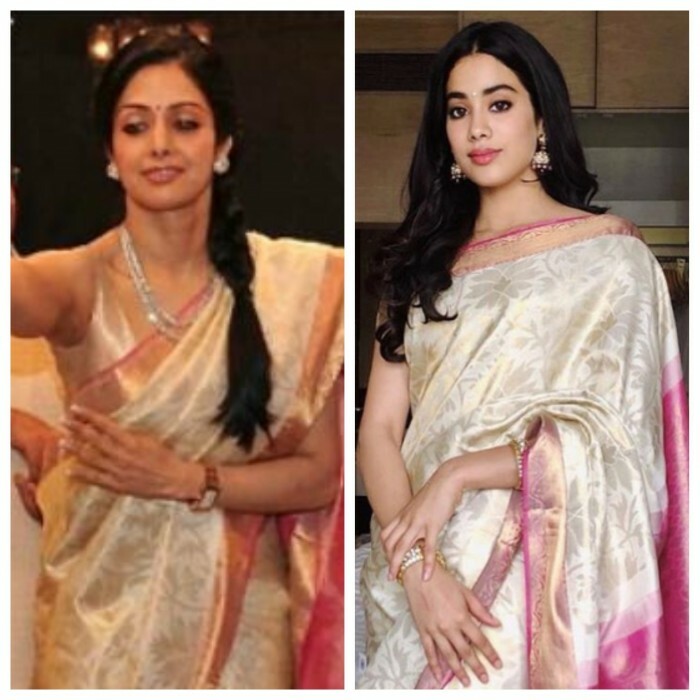 Home » Telugu » News » Janhvi Kapoor wears saree that was worn by her mom Sridevi at Ram Charan’s wedding and she looks beautiful! Janhvi Kapoor wears saree that was worn by her mom Sridevi at Ram Charan’s wedding and she looks beautiful! While Sridevi had worn the elegant sari with a sleeveless blouse, Janhvi customized the sari with a simple cropped sleeved blouse, jhumkas and a heavy bangle. Janhvi Kapoor wears saree that was worn by her mom Sridevi at Ram Charan's wedding and she looks beautiful! Janhvi Kapoor is surely setting her foot right in the industry like her talented mom, Sridevi. While she is gearing up for her Bollywood debut, the young beauty is impressing us with her adorable gestures for her late mom, Sridevi. Janhvi Kapoor recently made a very gracious appearance in a cream and pink silk Kanjeevaram sari at the National Film Awards function in New Delhi. Yes, that’s the same sari that her late mother Sridevi wore when she had attended the wedding of Telugu actor Ram Charan, veteran actor Chiranjeevi’s son, in 2013. While Sridevi had worn the elegant sari with a sleeveless blouse, Janhvi customized the sari with a simple cropped sleeved blouse, jhumkas and a heavy bangle. Janhvi’s younger sister Khushi picked a traditional south Indian-style half sari for the event. The very young and pretty @khushi05k in traditional wear at the NationalAwardCeremony #manishmalhotraworld @janhvikapoor #boneykapoor @mmalhotraworld #memorable and unforgettable Sridevi . Daughters Janhvi, Khushi and husband Boney Kapoor collected Sridevi’s Best Actress National Award for film MOM. Janhvi Kapoor is all set to make her debut in Dhadak opposite Ishan Khatter. The actor looks like the spitting image of her late mother Sridevi who was known for her beauty and acting. manish seems to care about the girls more than anil kapoor and fam..
Jhanvi is hideous, all those plastic surgeries are so obvious , lip job, cheek implants, a weird MJ nose. That god for one sane comment! Sridevi started looking good post ‘marriage’ but her looks went downhill after her plastic surgeries. Still in the above pic she is looking good due to her hair style. her daughter is just passable. Looks just too good in that sari. She carried off that saree really well..